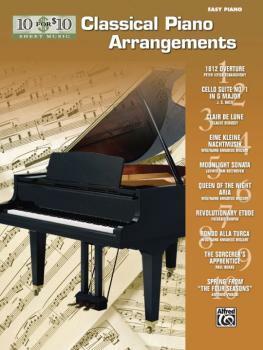 10 for 10 Sheet Music: Classical Piano Arrangements contains the most beloved melodies from the best composers of all-time. Arrangers include Carol Matz, Bruce Nelson, E.L. Lancaster, Mary K. Sallee, Tom Gerou, Jerry Ray and Robert Schultz. Titles: 1812 Overture (Tchaikovsky) * Cello Suite No. 1 (Bach) * Clair de lune (Debussy) * Eine kleine Nachtmusik (Mozart) * Moonlight Sonata (Beethoven) * Queen of the Night Aria (from The Magic Flute) (Mozart) * Revolutionary Etude (Chopin) * Rondo alla Turca (Mozart) * The Sorcerer's Apprentice (Dukas) * Spring (The Four Seasons) (Vivaldi). Copyright © 2003-2019 Classical Vocal Reprints. All Rights Reserved.